DIY projects are fun! As a homeowner, doing home renovations or home repairs makes one feel accomplished and grateful. First of all, because you have a house. Second of all, home DIY projects gets a few family members or family friends to socialize with. One home renovation that residents do in the state of Arizona is roof repairs. As we all know, most of the Arizona is a desert, which means a heat. Most people do roof repairs to improve the insulation of their home or to make their home more energy efficient. Whatever the case may be, doing a roof repair in Buckeye as a DIY project is a bit risky. 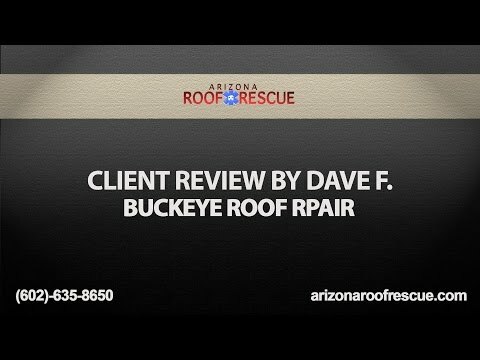 Arizona Roof Rescue has a three reasons why hiring a roofing contractor in Buckeye to do the repairs is the best approach rather than converting it into a DIY project. As a homeowner, you might of research the ten important home renovations to keep in mind when owning a house. Roof repairs or new roof installation must of been at the top of the list. Depending on what you do for living, you might have little to no clue on how roofing works. A professional roofer spends hours working with contractors. Every time a roofer spends the day on the roof, he/she learn more about the job. Every roof and home is different, and the home structures are advancing. Repairing a roof is a similar process with every roof. The difference is the condition, the reason why the repair is a must or need, materials, tools, equipments, and the instructions to do the repair. As a homeowner, you can do all the research and take every precaution, but it’s not the same knowledge and experience that a licensed roof contractor has. If you are planning to do a roof repair for the first time, there is high chance that something might go wrong, or your work will conclude for more repairs of damages. If your job consist of sitting on a chair or being on ground level for eight hours, you should not be wandering around your roof clueless. Remember, doing roof repairs means being about twenty feet off the ground. Sometimes, when someone is learning how to conduct a certain a job, they need to physically feel and see how it should look. Wondering on the roof, you can fall and get seriously injured or even die from that height. A professional roofer not only has the experience, but the proper training and equipment to repair the roof, safely. As mention before, the home structures have advance, and so has the technology. A license, expereince roofing contractor keep themselve up to date. They know what to look for and what equipment will keep them safe from harm. You can have a safety harness, but if you do not know how to use it, or wear it poorly, you may injure yourself more. Let a license and experience roofer do the repairs, they know what needs to be done and how to get it done, safely. If you do the roof repairs, and if it was done properly, you may have saved money. If it was vise versa, then you ended up spending more money and time. Whenever a home renovation is being done, everyone in your home adjust their schedule. Besides, your home looks like a construction site. Probably, you did the roof repair within a week or a weekend, depending on the project, and ask time off of work in order to get the job done. It’s a week when the kids are at school and have other activities going on after school. Plus, the wife has a big a project at work, which means she won’t be at the house much during the day. You’ve done your research, you are well aware of the requirements , and how to be safe. You get the job done on time. Next thing you know, the flashing or a few shingles are sliding off your roof and you don’t know why. Now you have a roofing contractor inspecting the your roof, and it turns out the roof is in worse condition than you thought, and your DIY project might have made it a bit worse. The roof contractor explains why your repairs fail, and what the next course of action is. The contractor explains your options, you discuss it with the family, and your home is a bigger construction site while the roofers install a new roof for your home. Not only did you end up spending more on expenses, but also time. Hiring a roof contractor to at least inspect the condition of your roof is the best way to start a DIY roof project. The roof contractor can explain you what needs to be done, and give you options. It may be a simple job that you may do as a DIY project, or its a job that need to be done by a professional. Home renovations can are time consuming, expensive and fun to plan. One does save more money when doing the project on your own, although, it’ll be beneficial for you to have a contractor conduct an inspectation and give you a quote. Roof repairs may be a fun DIY project, but, again, it best to hire a roofing pro. A roofer has the experience, has the training to be safe, and it will safe you time. Arizona Roof Rescue has more than 15 years of doing residential and commercial roof repairs. We are a contracting roof company in Buckeye that believes in customer service and client relations. We provide affordable service for people who really need it. If you are thinking about repairing your roof, contact us first at 602-242-2706. Get a free consultation and let us help you decided the next best course of action.